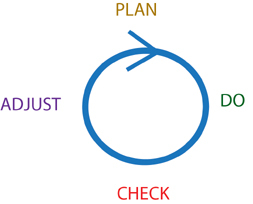 PDCA is the Continuous Process Improvement (CPI) movement’s acronym for the steps in an improvement project. The letters stand for Plan, Do, Check, and Act. These verbs refer to the activities required for a single improvement project. Obviously, the first activity is Planning. The next activity is executing the plan, or Doing. The next activity is Checking to see if the execution actually met the criteria of the plan. If so then the project team moves on to the planning phase of the next project. However, if not, then the project team “Acts” both to fix the current project as well as to fix the process that created the unacceptable outcome. 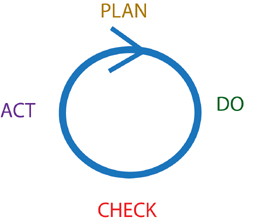 This is typically illustrated as the standard PDCA cycle. Since the usage of the word “Act” is sometimes confusing to people new to this process. I prefer to use the word “Adjust” as the last item in this cycle… illustrated as the PDC Adjust cycle. 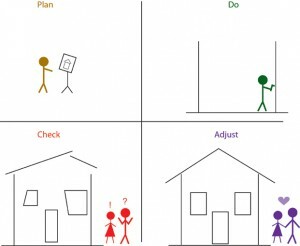 Referencing a “snowman” example that I once saw from the Lean Enterprise Institute, I illustrate this concept to my clients and students with this illustration of building a house. Page Sequence Note: Even though PDCA is a foundational principle, it is just that… a foundation. It is not the whole house. There is much more required for successful and sustainable organization turnaround. Because you can begin to achieve huge benefits, starting in less than 90 days with the methods presented on this site! For example, here are some results for Manufacturing Consulting Services, Inc. clients which include both manufacturing and non-manufacturing organizations. Diamond drill bit average throughput time dropped from 10 days to 1 day. Production time for the actual fabric cover for an automatic pool cover manufacturer dropped from 1.5 days to 45 minutes. Intellectual Property processing time (the interval between when a company researcher proposes a new idea and when the company’s General Consul applies for a Provisional Patent) decreased from between 2 years to under 8 weeks. Reduced interval between when an item was received on the dock to when that item was ready for invoice payment for a cleaning equipment manufacture from 75 days to 6 days. For organization turn-around-results graphs, see Lean Thinking Results at a Diamond Drill Bit Manufacturer and Cleaning Equipment Company Lean Thinking Results These methods really do work. For further examples of concrete results, see the Case Studies link on the home page. This site contains much, much more than just a humorous PDCA graphic. Site readers who encounter this page from following the sequential, horizontal page links starting at the bottom of the Resources page will note that this page is the 2nd of many on this site containing foundational theory and real examples and results of standard CPI tools as well as additional tools applied by Manufacturing Consulting Service’s clients. We truly hope to inspire you to commence and continue your own Continuous Process Improvement journey! Hence the very existence of this site… containing results within the context of application stories so you can better grasp how to use the illustrated tools in your own situation… versus merely containing “results”….